guess what is absolutely necessary when a foodie travels? yes, some nice food for the journey! usually i am a real fan of sandwiches, with egg and bacon, cheese and calamata olives with some chive and always a good splash of mayonnaise. but our last journey started that early in the morning that i could not imagine preparing sandwiches in the morning. so i was looking for something i could prepare in advance and thanks to one of my new cookbook treasures: homemade winter, i found this hearty kale frittata. and kale is in season! contrary to all the sausages, pizzas and toasts you usually can buy while traveling, the kale frittata is real food, down to earth. it consists of eggs, cream, cheese, bacon and of course kale. and it’s a real good finger food. 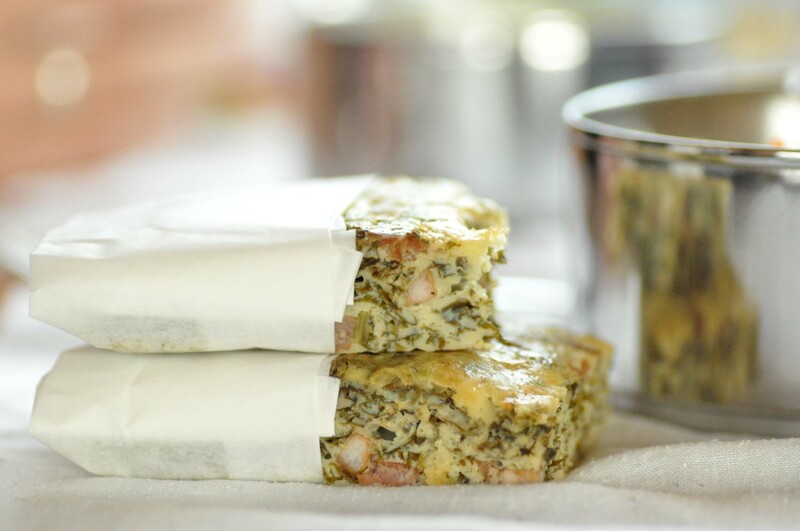 if you don’t plan a journey in the near future, just enjoy the kale frittata for a picnic, party buffet, office snack or at home. as a veggie version you can drop the bacon and try some hazelnuts instead. experiment and please don’t forget to share. finely chop the kale. cut the bacon in small cubes and fry in some oil. add the kale and deglaze with a splash of white wine. add the bay leaf and some salt and pepper. simmer for about 25 minutes and add some water from time to time. in the meantime combine the eggs, cream, grated parmesan cheese, salt and pepper. preheat the oven to 180°C. line a baking dish with some baking paper. the baking dish should be about 20 x 30 cm. put the kale and bacon mixture in the baking dish and pour over the egg mixture. bake for 25 minutes. let it cool and cut into squares. enjoy now or later or tomorrow, it will be fantastic! den grünkohl fein hacken. den bacon würfeln und in öl anbraten. den grünkohl dazu geben und mit einen guten schluck weißwein ablöschen. lorbeerblatt, salz und pfeffer dazugeben. etwa 25 minuten leise köcheln lassen und gegebenenfalls von zeit zu zeit etwas wasser dazu geben. in der zwischenzeit die eier, sahne, den geriebenen parmesan, salz und pfeffer miteinander verrühren. den ofen auf 180°C vorheizen. eine auflaufform mit backpapier auskleiden. die auflaufform sollte etwa 20 x 30 cm groß sein. die grünkohl und bacon mischung in die form geben und die eiermasse darüber gießen. 25 minuten backen, auskühlen lassen und in quadrate schneiden. sofort, später oder morgen genießen, es wird auf jeden fall fantastisch schmecken! This entry was posted in recipes, winter and tagged kale by The Cook. Bookmark the permalink.